Our Cabin Creek collection conveys a reclaimed wood vintage feel. Each piece is physically distressed by hand providing a unique one of a kind look. The Cabin Creek Kitchen Cart by Home Styles is constructed of poplar solids and mahogany veneers. Features include two push through storage drawers accessorized with towel rack, two fixed slatted shelves and hammered metal look finished frame. This piece is finished on all four sides. size: 43.75-inch W 20.5-inch D 36-inch H.
This 22" Apartment Cart is perfect for adding additional work space and storage to your kitchen area. 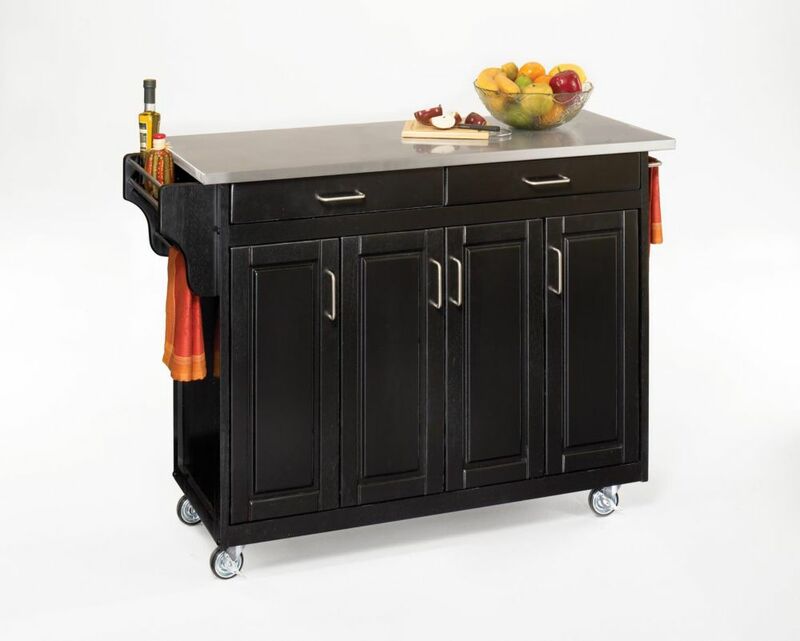 The cart features a side towel bar, one storage drawer, an open bottom shelf and one spacious closed door cabinet space. Easy roll casters provide for easy mobility around your room. The light green finish is perfectly accented with modern styled silver pulls and a staineless steel top. Create-a-Cart Black Kitchen Cart With Stainless Top Home Styles Create-a-Cart in a Black finish with a stainless steel top features solid wood construction, four cabinet doors open to storage with three adjustable shelves inside, handy spice rack with towel bar, paper towel holder, and heavy duty locking rubber casters for easy mobility and safety. Size: 48-3/4-inch W x 17-3/4-inch D x 35-inch H.
Create-a-Cart Black Kitchen Cart With Stainless Top is rated 3.7 out of 5 by 11. Rated 2 out of 5 by MeasureTwiceCutOnce from For looks, I'd give it five stars, but the top... For looks, I'd give it five stars, but the top drawers don't close. Also, in my opinion, even if it assembled without issues, it's over-priced by about $150. Add to that the hassle of having to contact someone for help on how to correct the drawer problems, and I'm struggling to give it an overall 'Fair' two-star rating, even though I'm wondering if it's really a 'fair' deal for the extra money and time spent. Rated 5 out of 5 by Muhammad from Love the look!... Love the look! Rated 5 out of 5 by mario from Just as shown. Quality was excellent. Beat my expectations. Definitely recommend it. Just as shown. Quality was excellent. Beat my expectations. Definitely recommend it. Rated 5 out of 5 by Fnu from Working as expected. I have assembled many products from various sources and this was by far the ... Working as expected. I have assembled many products from various sources and this was by far the easiest. Rated 2 out of 5 by Davebuilder from Be ready to return it, make sure you have a drill handy. The first one of these I ordered came broken. I took it in for a refund and ordered another one. (1 hr wasted on the trip & return). The second one took 4 hours to put together. I am a semi-pro at these things with a typical Ikea dresser taking 20-30 mins. In the process I had to re-drill 8 holes just to get the drawers to close (to make the face of the drawer able to clear the bottom edge of the counter). The drawers are still seated crooked even though they can now close all the way. Also there are several poorly machined other pieces of the unit and you can see light coming in the cabinets due to the crooked cuts. The material is generally good - it's the workmanship that is incredibly poor. If you're willing to gamble on the outcome and/or waste your time, go ahead and try it, otherwise I can't recommend this one. Rated 5 out of 5 by Korns from Worth evey penny! It was worth every penny! I absolutely love it! I needed the counter space and cabinet space. Did what I wanted it too! EASY INSTALL! Rated 1 out of 5 by 32cnm from This is a poor product Inspect each part for damage. Returned the first cart ordered due to a damaged panel. Ordered another cart. Second cart had a different damaged panel than the first one. Sent email to the manufacturer with picture of panel, box cart was shipped in, and where to ship the new panel. Received new panel in from UPS. New panel was also damaged. However, I used wood glue and installed in a direction that would hide damage under the top. You must assemble entire cart and drawers. Each part is labeled with a letter and sometimes directional arrows. The arrows were not always put in the right direction or on the correct side. A hole was drilled in wrong spot and was plugged and a new hole was drilled in the correct spot. Scratches. Rated 3 out of 5 by Hazel from nice island but disappointed with the stainless steel top The island was easy to assemble and looks nice overall but the stainless steel top is made of a poor quality material because is scratches very easily.